From My Brown Eyed View : Immigration Reform is not just a Latino Issue! What about African and Caribbean People? Immigration Reform is not just a Latino Issue! What about African and Caribbean People? If you have been following the conversation and debate about Immigration Reform, it would appear that the sole beneficiaries of a policy that provides a pathway to citizenship are Latinos. However, this nation has other populations that would benefit from a clear cut policy in this area. 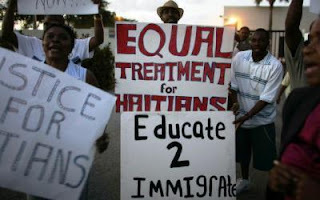 What about the people of African and Caribbean descent? How would a reformed immigration policy benefit them? Can their respective populations look forward to inclusion or exclusion? What do you know about the Diversity Visa Lottery Program and how it has opened a pathway for African and Caribbean people to enter the United States? Did you know that there is currently an attempt to eliminate this program by members of Congress? Are there African and Caribbean Dreamers? What do they think about the failure to pass the Dream Act? How are African and Caribbean families affected by the failure to reform Family Immigration Act? The Immigration Reform discussion has been focused on an image that is racialized and Spanish speaking. We are not hearing enough about the other immigrants of color who are currently in the United States or working on gaining entrance. This is the topic that will be explored this week on MBEV 2.0. Rippa from The Intersection of Madness and Reality is going to be featured as a guest blogger on this topic. He has a personal insight on the subject of Immigration Reform that I am sure is going to enlighten and even stir up some mixed feelings. But this is how he throws down on this subject. I am looking forward to his guest post this week. Tomorrow, MBEV 2.0 will feature information on the Diversity Visa Program and what Republican members of Congress are proposing to do with this particular program.